SHSU dance professor Cindy Gratz will discuss how “John Michael Montgomery Was Right: Life’s a Dance You Learn as You Go…Sometimes You Lead and Sometimes You Follow” on Monday (Oct. 22). The Honors 3332 Journeys Seminar presentation will begin at 4 p.m. in Smith-Hutson Building Room 186. Gratz, who has been dancing since the age of 2 when she began hula training with her mother (who is also a dance professor), said her lecture will focus on the inclusiveness of dance. Gratz earned her bachelor’s and master’s degrees from the University of California, Los Angeles, and her doctorate from New York University. Her “journey” to SHSU has included riding elephants with Ringling Brothers & Barnum and Bailey Circus and touring the country as a solo concert modern dance artist. In addition to founding The Primetime Dancers, she has established two other dance companies: the multi-cultural dance The Polynesian Dance Review of Huntsville, Texas, and socially relevant concert modern dance The Gratz Dance Ensemble. In 2010, Gratz was selected by Dance Teacher Magazine to receive the “Dance Teacher of the Year in Higher Education” award. Her lecture, sponsored by the Elliott T. Bowers Honors College, is part of a new class designed to show students what characteristics lead to success. For more information, contact instructor Patrick Lewis at 936.294.3397. Texas State Reps. John Otto, R-Dayton, and Charles Schwertner, R-Gerogetown, will discuss the upcoming legislative session and answer questions at “The Hot Seat in Huntsville” on Thursday (Oct. 25). Presented by The Texas Tribune and SHSU’s department of mass communication, the public discussion will be from 11:30 a.m. to 1 p.m. in the James and Nancy Gaertner Performing Arts Center. Otto, who was first elected in 2005, represents District 18, which includes Liberty, Polk, and part of Montgomery Counties in the Texas House of Representatives. Schwertner is the Republican candidate for Texas Senate District 5, a seat currently held by retiring Sen. Steve Ogden. Schwertner is a managing partner and practicing physician at Georgetown Orthopedics, PLLC, which provides annual care for 20,000 patients. A light lunch will be provided for those who have made reservations. For more information about the event, or to make reservations, contact the Texas Tribune at 512.716.8641, rsvp@texastribune.org or texastribune.org/events. Music professor Aric Schneller will direct SHSU’s premier Jazz Ensemble and the Jazz Lab Band in a concert that will combine familiar classics with a new spin, as well as modern, cutting-edge jazz charts. Joining the ensembles—on Thursday (Oct. 25) at 7:30 p.m. in the James and Nancy Gaertner Performing Arts Center Payne Concert Hall—will be guest artist Drew Zaremba, a composer, arranger, saxophonist, and former member of the Grammy-nominated University of North Texas One O’Clock Lab Band. Schneller started his research for the concert this summer, taking note of music he heard that he thought would be a good fit either for a specific musician in the band or for the band in general. “I try to choose music that will benefit the band in terms of jazz history and the different styles—rock fusion, swing, jazz, Latin jazz,” Schneller said. “But I also look for what’s modern today, new arrangements of older tunes that people know. Unlike the big band sound of Benny Goodman and Artie Shaw of the 40s, which was composed and arranged more for dancing, modern jazz today is considered more “art music,” according to Schneller. “You sit down to listen to it, but you aren’t dancing, although the rhythms are such that you can tap your foot and you’re moving your body when you’re sitting, if it’s done right,” he said. While the rhythms are still there, today’s modern jazz differentiates itself in other ways, too. “The harmonies are a little more inventive; however, it’s definitely bluesy, but with fast tempos and meter shifts,” said Schneller. The evening’s program also has pieces that reveal influences from other genres. As a teacher and a musician, passing along that diversity of music to his students is important to Schneller. “Miles Davis really pioneered moving forward with jazz, always changing, because jazz is improvisation—having a form but saying what you want to say,” he said. For more information, to make reservations or to purchase tickets, call the GPAC Box Office at 936.294.2339 or visit shsu.edu/cofamc/boxoffice. SHSU teachers can become among “the broad range of learners” while enhancing their knowledge on the “Art of Teaching” on Oct. 29, when the Professional and Academic Center for Excellence will host its second workshop in a series on the subject. Patrick Allitt, the Cahoon Family Professor of American History at Emory University, will share his thoughts on “The Great Courses: Best Practices from a Master Educator” from 3:30-4:30 p.m. in the PACE Conference Room, in College of Humanities and Social Sciences Building Suite C002. His presentation will examine ways to be as effective and successful a teacher as possible, both for the education of students, as well as personal and professional growth. Allitt’s student ratings have shown him to be an excellent lecturer; however, not everyone agrees with his take on mastering the “art form,” according to Marsha Harman, PACE director. The session, co-sponsored by the foreign languages department, will include a discussion period. It is open to faculty, staff and students. He is the author of six books and presents seven lecture series with "The Great Courses." His current writing project is a history of the major environmental debates in the United States since World War II. Allitt earned his bachelor’s degree from Oxford University and his doctorate from the University of California, Berkeley. He also served as a postdoctoral fellow at the Harvard Divinity School for three years and at Princeton University. The final “Art of Teaching” series workshop will be on Nov. 26. Those who wish to participate in his presentation should register by noon on Wednesday (Oct. 24). For more information, or to register, contact PACE at pace@shsu.edu or 936.294.2688. Representatives from the College of Criminal Justice’s victim studies program will highlight the degree program, internships, the Crime Victims’ Institute, and a student organization in the field during an open house on Thursday (Oct. 25). The open house will be held from 10:30 a.m. to 2 p.m. in the Criminal Justice Center’s Friel Room, where students can meet with faculty, students and staff in the program and enjoy pizza and beverages. Sam Houston State University’s bachelor’s degree in victim studies is one of the few of its kind in the country and offers a multidisciplinary degree consisting of courses from criminal justice, political science, business and psychology. Graduates can serve in crime-specific programs for domestic violence shelters, anti-drunk driving campaigns and agencies that protect children, the elderly, immigrants and those who are physically or mentally abused. In the future, the college is expected to introduce a master’s program to develop administrative leaders in these professions. The college offers about 50 internship opportunities with federal, state and local agencies. Faculty and student research is on the cutting edge of emerging issues through the Crime Victims’ Institute, an agency created by the Texas Legislature to improve services to victims, provide research on key issues, offer a voice for victims, and recommend policies to state and local governments. The institute has produced studies on the Choking Game, gangs, intimate partner violence, immigrants, elder abuse, hate crimes and the availability of victims services in the state, to name a few. Finally, students can meet members of the Crime Victim Services Alliance, an organization dedicated to preserving and enhancing the rights of victims by featuring speakers from the field and actively supporting victim rights through clothing drives, community service and office visits. SHSU musicians will create international affairs in the Gaertner Performing Arts Center as two groups will perform works celebrating “Octubafest” and Antonio Vivaldi’s “Gloria” beginning Tuesday (Oct. 23). The Octubafest recital, which will begin at 7:30 p.m. that day in the GPAC Recital Hall, will include European- and American-composed selections performed by faculty musicians. Accompanied by staff pianist Kaju Lee, euphonium professor Henry Howey and tuba professor Robert Daniel will come together to present a “brass” rendition, arranged by Howey, of a Mozart duo originally written for the bassoon and cello. The concert will also include performances by Howey of pieces by French composer J. Ed. Barat and Austrian composer Gustav Mahler, as well as performances by Daniel of a work for tuba and piano by American composer Halsey Stevens, as well as a “unique and different piece for tuba” titled “Aboriginal Voices” by Neal Corwell. For more information, call the School of Music at 936.294.1360, and for ticket information, call the GPAC Box Office at 936.294.2339 or visit shsu.edu/cofamc/boxoffice. The university’s premiere choral ensemble, the SHSU Chorale, is set to perform an illuminating program of early 18th century sacred music and contemporary compositions, culminating with a few familiar modern surprises, on Saturday (Oct. 27) at 7:30 p.m. in the James and Nancy Gaertner Performing Arts Center Concert Hall. Director of choral studies James Franklin will lead the Chorale, a 40-member mixed group of music and non-music majors, in “a variety of music” that exposes students to “major milestones in the repertoire,” he said. “Much of what we listen to, study and perform from the 1400s through the 19th century was written for the church or written out of that tradition,” he said. Franklin selected Antonio Vivaldi’s “Gloria” as the central work for the upcoming concert and chose pieces that built upon its theme. “‘Gloria’ is really a song of praise; it’s part of regular liturgical worship in the Catholic Church,” Franklin said. “The interesting thing is that most composers set that all together as one thought, but Vivaldi breaks it up,” Franklin said. “It’s all really the same announcement from these angels but Vivaldi chooses, for one half of the text, to focus on the things above and the other, on the things below, on Earth. The Chorale will also perform three psalms, or prayers, written by Latvian composer Sisask, Swedish composer Hansson, and Russian composer Rachmaninoff. The set opens with “Oremus,” an invitation to pray; then transitions to a prayer for illumination, the ability to move through a difficult time (“Lighten mine eyes”); and closes with “Blazén muzh,” which says there are blessings for those who persevere under terrible conditions. “What’s interesting about these pieces is that, written in different times and places, they talk about being persecuted and depressed, and ask for the same thing, ‘Grant me this light, God,’” Franklin said. Franklin will close the concert with lighter fare, a surprise. The week following the concert, the Chorale will tour to five southeast-Houston area high schools to promote the SHSU School of Music and the group. They will also perform a public concert at Christ the King Evangelical Lutheran Church, next to the Rice campus, on Nov. 1 at 7 p.m.
SHSU’s Career Services will aid students in need of help making a major college decision—selecting a field of study—on Wednesday (Oct. 24). 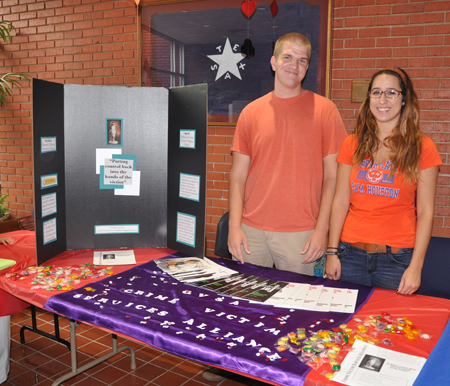 The Exploring Majors Fair will be held from 10 a.m. to 2 p.m. in the Lowman Student Center Ballroom. The event will allow students seeking a major to speak to representatives from more than 30 academic departments, as well as academic advising staff about choices of majors, in one central location and in a casual atmosphere, according to Pam Laughlin, director of Career Services. “Students are encouraged to drop by the LSC Ballroom on a come-and-go basis to gather information, have their questions answered, and to register for some great door prizes to be awarded after the fair,” she said. The Honors College, McNair Scholars Program and Project CONNECT will be available to talk about their programs as well. The event is cosponsored by the Student Success Initiatives Office. Three SHSU students will examine what’s “Between” the variables of speech in an independent exhibit beginning Monday (Oct. 22) in the Lowman Student Center Art Gallery. “Between,” a series of paintings, drawings and installations, will be on display from 8 a.m. to 11 p.m. through Oct. 29. A reception for Melly Rae, Jamie Kinosian and Agnes Stelmach, all three senior studio art majors, will be on Tuesday (Oct. 23), at 6 p.m. in the gallery. “Between” is the result of Kinosian and Stelmach being inspired by an “intriguing piece about communication” created by Rae, Kinosian said. 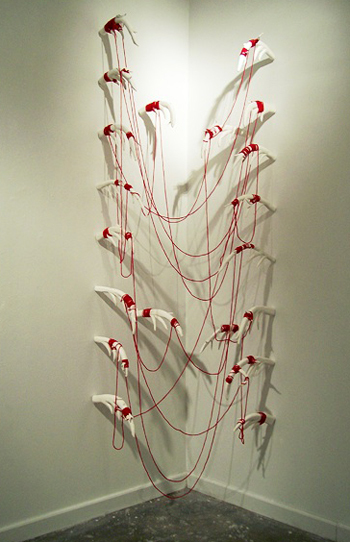 “We started off by observing Melly's ceramic piece about communication that involved horns and a red string, and we made our work based on the same concept and used some of the imagery,” she said. The exhibit, then, is based on the premise that communication is what connects individuals together. Each artist’s work varies in the media used: As an installation artist, Rae’s work involves ceramic pieces and found objects; Kinosian is a drawing artist who uses a lot of ink for the work in the show; and Stelmach is a painter whose show pieces were created using oil paints. For more information on “Between,” contact Kinosian at ladykihanna@gmail.com. How webinar participants viewed Christopher Lowenkamp's presentation (above) and the panel discussion (below) during CMIT's first live broadcast of a field training. 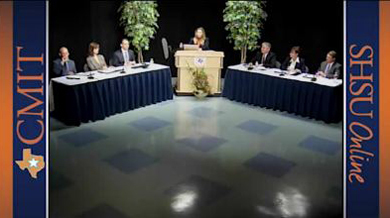 The Correctional Management Institute of Texas hosted its first live broadcast on the Internet for adult probation officers to discuss ways to implement research-based practices in the field. 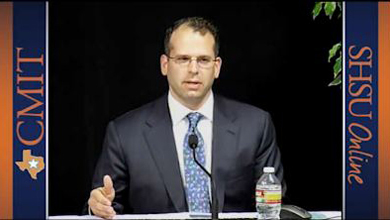 The live, interactive program featured Christopher Lowenkamp, former director of the Center for Criminal Justice Research and associate director of the Corrections Institute at the University of Cincinnati, as well as a panel of officials from community supervision and corrections, probation supervisors, and judges from across the state. The program also gave participants the opportunity to send in questions for the expert or panel during the live, two-and-a-half hour presentation. All that was needed to participate was access to a computer and the Internet. Lowenkamp, the author of several risk assessment instruments and cognitive behavioral curricula for offenders, said evidence-based practices are a process rather than a particular treatment or procedure. He urged participants to become the innovators or to follow the early adopters of plans in their offices to help implement evidence-based practice and then training others how to do it. The ideas presented were discussed by a panel of Texas officials in various aspects of the criminal justice process, including Leighton Iles, director of Tarrant Community Supervision and Correction Department; Judge Rose G. Ryan, of the 206th Judicial District Court of Hildalgo County; Mike Wolfe, director of Taylor County CSCD; Retired Judge John Creuzot, of Dallas County DIVERT Court; and Caroline Rickaway, director of Brazoria County CSCD. The program was moderated by Carey Welebob, director of the Texas Department of Criminal Justice’s community justice assistance division. The panelists talked about the challenges of implementing evidence-based practices and ways that different jurisdictions overcame those obstacles. The first professional webinar offered by CMIT and was hosted in collaboration with DELTA, which provides SHSU’s online courses, and the SHSU mass communication department.